Maldon Salt has become known worldwide. The key to its continued success lies in the production of a unique high qualityproduct using traditional natural methods. Maldon Salt is superior in quality and as a result has made its mark as aprestige product. DON'T PAY A PREMIUM PRICE FOR 250 GRAMS IN THE SUPERMARKET FOR SEASALT. SAVE WHEN YOU BUY IN BULK!!! Maldon Salt, a unique and prestigious product, has become known for its flavour and quality, sought after by the health conscious and gourmets alike. WE ARE A FOODSERVICE DISTRIBUTOR AND WE BUY IN BULK. 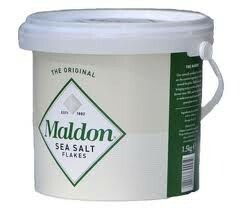 MALDON SEASALT ADDS FLAVOUR TO ANY DISH AND IS A MUST ON MEATS OR FISH DISHES. 1.5 KILO BUCKET - $12.95 POST FOR ANYWHERE IN AUSTRALIA!